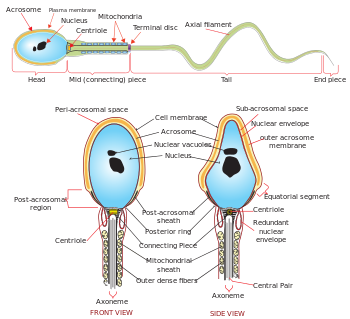 A sperm cell attempts tae penetrate an ovum coat tae fertilise it. 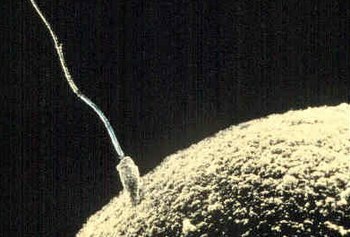 A spermatozoon (pronoonced /ˌspɜːrmætəˈzoʊən/, alternate spellin spermatozoön; plural spermatozoa; frae Auncient Greek: σπέρμα "seed" an Auncient Greek: ζῷον "livin bein") is a motile sperm cell, or muivin form o the haploid cell that is the male gamete. This page wis last eeditit on 21 November 2017, at 14:11.